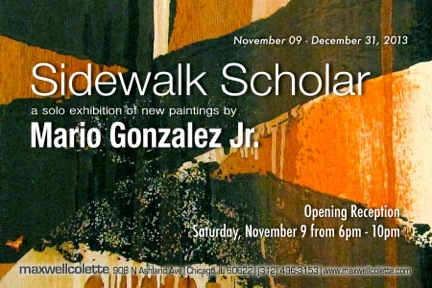 Sidewalk Scholar presents a solo exhibition of new work from Mario Gonzalez Jr. The show will feature large-scale mixed media paintings on wood along with site specific installation from the noted Chicago painter. This entry was posted in Openings and Events and tagged art, Arts, Chicago, Mario Gonzalez Jr, Maxwell Colette Gallery. Bookmark the permalink.